The explosion of the mobile platform truly is a sight to behold. From catchy slogans like “there’s an app for that”, to at least five apps on the market for any one conceivable process or problem, the mobile development industry has reached incredible heights, and is climbing every day. We strive to help our partners deliver nothing but the best digital experiences to their clients, with considerations for the state of the industry and what the next trends will be. As we help our partners elevate their business, we have found ourselves at an all-time high as well. We are proud to share that, hot on the heels of a lot of hard work, we have been named one of the top app mobile app development companies in San Francisco! This accolade comes to us courtesy of Clutch, an independent ratings and reviews platform, offering unbiased and in-depth research and reviews on B2B vendors across dozens of industries. After being put through the wringer with nearly 300 of the top developers in one of the most competitive digital markets in the world, we were lucky to be ranked so highly. The opportunity to hear from our clients is invaluable to us as we work to improve our operations and services. We strive to be the best partner in the development space, and reviews like the one above let us know we are on the right track. 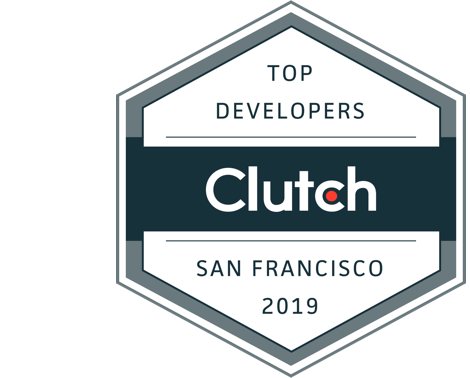 In addition to our presence on Clutch, we appear notably on their sister-site, The Manifest, as one of the top product design companies in the Bay Area. The Manifest is a resource that helps firms identify and address their industry challenges, providing them with insights and guides for potential solutions. We are included on their directory of top service providers primarily for the size of our agency coupled with the quality of our work, and we are grateful for the industry attention. Now we can also be found on Visual Objects, a space for app developers and other creatives to showcase their work to prospective clients. We hope that this comparative shopping platform will help more firms partner with us, and invest in quality digital solutions. Thank you to each and every one of our partners, we appreciate your support, and we look forward to continuing to grow together!